(L to R): Baruch College President Mitchel B. Wallerstein; John H. Banks, III, president of the Real Estate Board of New York; Betsy Werley, director of network expansion, Encore.org. 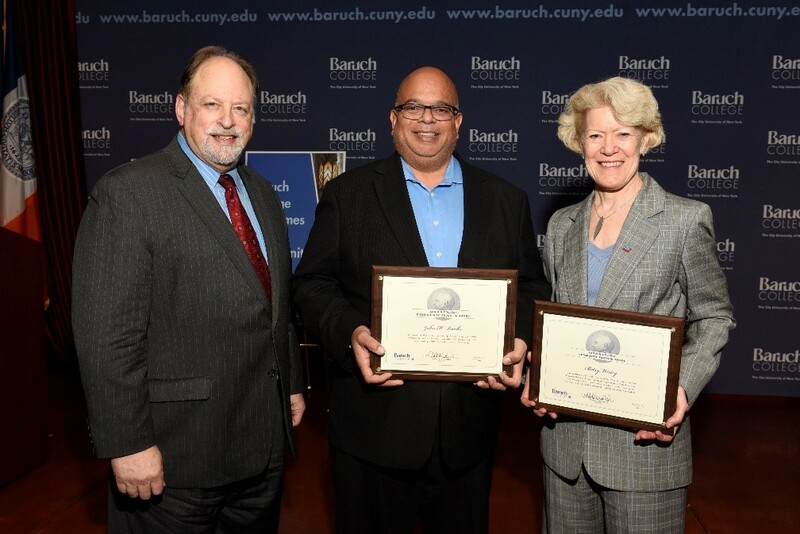 New York, NY, December 8, 2017 – Baruch College honored John H. Banks, III, president of the Real Estate Board of New York, and Betsy Werley, director of Encore.org’s network expansion, at its “Power of Community” reception held on December 6. The annual event was created to celebrate outstanding individuals who contributed greatly to Baruch College, and to New York City. “For more than a decade, Baruch has hosted this event as a way to recognize the value, importance, and power of what can be accomplished when we work together as a community,” said Baruch College President Mitchel B. Wallerstein, PhD., in his opening remarks. Among those attending the event where representatives from Flatiron 23rd Street Partnership, Manhattan Community Board 6, Greenwich Village Chelsea Chamber of Commerce, and Gramercy Neighborhood Associates. In recognition for his contribution to public service and continued work on behalf of New Yorkers, John H. Banks, III received Baruch’s Distinguished Leader Award. In 2014, Banks was appointed as president of the Real Estate Board of New York, the city’s leading trade association with more than 17,000 members. During his tenure, Banks has advocated for the enactment of the Affordable New York Housing Program, the approval of the Greater East Midtown Rezoning, and legislation to address critical issues ranging from sustainability and illegal short-term rentals. He established the Residential Listing Service Syndication which provides up-to-date information for consumers and the real estate industry. Previously, Banks was the vice president of government relations at Consolidated Edison, Inc. for 13 years. He also served as vice chairman of the New York City Charter Revision Commission in 2010, and worked on New York City Mayor Bill de Blasio’s transition in 2013. Prior to Con Edison, Banks operated as the Chief of Staff for the New York City Council from 2000 to 2002, and worked at Mayor Edward Koch’s Office of Operations, where he was responsible for reviewing, monitoring, and preventing potential corruption in city administrative and tribunal agencies. Banks is an alumnus of Baruch College, holding an Executive Master of Public Administration from the Marxe School of Public and International Affairs. He currently serves on the boards of the New York Public Library, Vincent J. Fontana Center for Child Protection, and Manhattan College. The Community Partner Award was given to Betsy Werley for her role in establishing the Financial Women’s Association (FWA) Mentoring program at Baruch, and for her accomplishments in the public, non-profit, and private sectors that continue to enrich the lives of the College’s students and many New Yorkers today. Werley, who was past president of FWA and a long-time board member, began her career as a corporate lawyer and business executive at JPMorgan Chase. In 2005, she moved to the nonprofit sector as the first executive director of The Transition Network, a resource for professional women 50 and older who are seeking new connections, resources, and opportunities. Under Werley’s leadership, The Transition Network grew from one to 12 chapters. She was also a founding member of Coming of Age New York City and the Encore Network Steering Committee. Encore Network is a coalition of leaders and organizations who are committed to turning older adult’s lives into valuable assets by operating programs that help create a better future for young people and future generations. Werley has dedicated the current phase of her career to building the encore movement to help older adults realize their potential for improving our communities. In 2014, she officially joined Encore.org to develop its global strategy, and today serves as its director of network expansion.